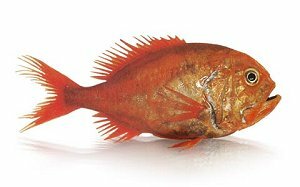 Orange Roughy with Salsa Glaze - Orange Roughy fillets, fresh lime juice, tomato salsa, mayonnaise, yoghurt, parsley. Orange Roughy in Mushroom Sauce - Orange roughy fillets, fresh mushrooms, onions, lemon pepper, yoghurt, parmesan cheese. Orange Roughy with Sherry & Herb Sauce - Orange roughy fillets with a rich sherry and herb sauce. Chicken broth, sherry, chives, basil, thyme, tomatoes. Baked Orange Roughy Italian Style - Orange roughy fillets, breadcrumbs, parmesan cheese, Romano cheese, garlic, parsley. Sweet Sake Marinated Orange Roughy - Japanese white miso, Japanese sweet sake, dark maple syrup. Lemon Orange Orange Roughy - Orange Roughy fillets, olive oil, lemon juice, orange juice, lemon pepper. Oven Fried Orange Roughy - lemon pepper, egg white, cornmeal, lemon zest, breadcrumbs, basil. Crispy Parmesan Orange Roughy - Orange roughy fillets, breadcrumbs, parmesan cheese, oregano, paprika, tartare sauce. Orange Roughy Casserole - Orange Roughy fillets, mashed potatoes, onion, cream, breadcrumbs, paprika. Orange Roughy with Sautéed Vegetables - Orange Roughy Fillets, carrots, mushrooms, onion, green pepper, lemon wedges. Orange Roughy with Zucchini & Tomato - Orange roughy fillets, zucchini, crushed garlic, crushed tomatoes, dill. Orange Roughy Fillets with Coriander & Chili Sauce - Fresh orange roughy fillets, red pepper, onion, fresh coriander, chili garlic sauce, soy sauce, lemon juice. Orange Roughy in Wine - Orange roughy fillets, white wine, lemon zest, olive oil, fresh basil. Orange Roughy Fillets with Lime - Orange roughy fillets, white wine, lime juice, olive oil and green onions. Baked Orange Roughy Fillets Italian Style - Orange roughy fillets, parmesan, romano cheese, garlic powder, parsley, breadcrumbs.